Here is my Fidelity YTD tax report on short-term losses. Why does it show a wash sale disallowed loss for the VTI holding, but not for the VV holding? The sale on 4/2 was a wash sale because of the purchase on 3/16. Note that the disallowed loss causes an adjustment to the basis of the purchase on 3/16, which was subsequently sold, so you actually do get the tax benefit of the loss. For the sale on 12/17, there was no additional purchase within the wash sale period, so there’s no reason for it to be a wash sale. However, the period extends into next year, so if you purchase more VV within that period, then that may be a wash sale, too. Wash sales are not an issue an entire position is closed out by the end of the year. If they are not, the loss deduction is disallowed and must be carried forward. For VV, there is no date acquired or date sold info. I'm guessing that the position was acquired over time (multiple dates), hence the reason for not listing these. I'm also going to guess that even if there were wash sale violations within the period of ownership then because you sold your entire (?) position of VV shares in 2018, then there is no wash sale carryover violation and you are allowed to deduct the full loss. 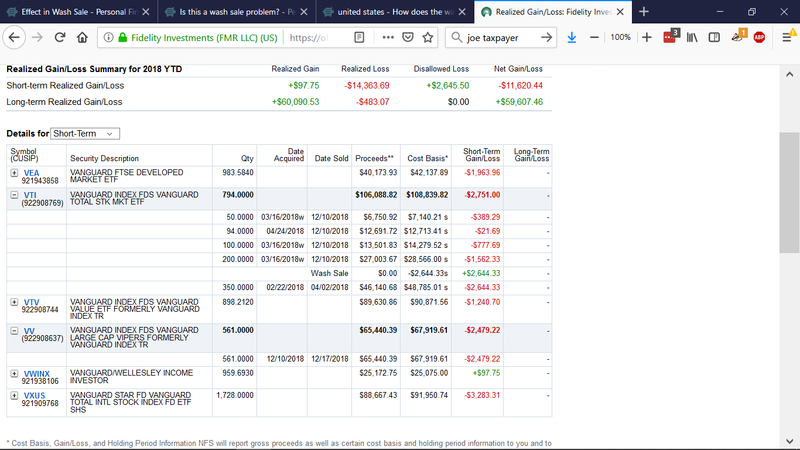 The 350 shares of VTI sold for a loss on 4/02 was a wash sale because you bought back shares on 4/22 and that violated the 60 day window (30 days before or 30 days after). I would assume that you did not sell off your entire position in VTI and therefore, the loss has been disallowed and must be carried forward to next year. In order to accurately analyze this, a chronological list of all trades since the first purchase would be needed and honestly, I'm not going there. Ironically, I spent half the day today collating my 2018 trades to determine what my wash sales situation looks like and where I have carryover issues. Where possible, I'm going to close the entire position this coming week to reduce/eliminate the bookkeeping headache. A wash sale occurs if you buy replacement shares for those you sell at a loss, within 30 days before or after the sale. The actual shares you sell are not replacement shares even if they were bought less than 30 days before. In VTI, your loss realized on April 2 was disallowed because you bought replacement shares on March 16. In VV, you had only one purchase and one sale, so there were no replacement shares. A good explanation of the wash sale rule is here. The intent is to prevent you from deducting a loss that you have not genuinely realized. If you buy replacement shares around the same time as the sale, then from a risk perspective, you essentially remain invested the whole time -- the purchase and sale are likely to occur at similar prices and are thus a "wash". It would be a giant loophole if people could effectively deduct unrealized losses, while also not being taxed on unrealized gains. Not the answer you're looking for? Browse other questions tagged united-states capital-gains-tax wash-sale or ask your own question.